77 by 87 by 53 in. 195.6 by 221 by 134.6 cm. 38 by 191 by 37 1/2 in. 96.5 by 485 by 95 cm. 23 1/2 by 17 by 10 in. 59.5 by 43 by 25.5 cm. 27 1/2 by 13 by 11 1/2 in. 70 by 33 by 29 cm. 31 by 27 1/2 by 10 in. 78.5 by 70 by 25.5 cm. 12 1/2 by 8 by 18 in. 32 by 20 by 46 cm. Anthony Caro: New Galvanised Sculptures October 18 - November 21, 2007 New York: June 27, 2007 -- Mitchell-Innes & Nash is pleased to announce an upcoming exhibition for British sculptor Anthony Caro in its Chelsea gallery from October 18 through November 21, 2007. The show marks the artist’s third exhibition at Mitchell-Innes & Nash since the gallery became Caro’s exclusive U.S. market representative in 2002. It will be Caro’s first exhibition in Chelsea. Mitchell-Innes & Nash opened its Chelsea location in September 2005. The show will unveil a completely new body of work created over the past two years by the 83-year-old artist. In conjunction with the exhibition, Annely Juda Fine Art will present a complementary exhibition of works from this new series in London from September 12 through October 27, 2007. The exhibition will feature a selection of five large-scale, galvanized and painted steel sculptures, all on view for the first time. The sculptures’ abstracted forms are born of assembling, articulating, welding and galvanizing oversized pieces of steel. Always working without sketches or plans, Caro is an artist with an innate sense of form and materials, who prefers to work toward “making it real” than to operate from preparatory designs. As with much of Caro’s work over the last 20 years, the artist’s new series alludes to ideas of navigating interior spaces, enclosures, and pathways to exterior spaces. Works on view range in size from 7 to 10 feet high, and weigh approximately two tons each. 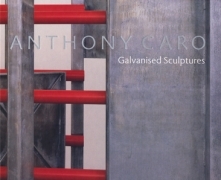 About the Artist: Born in 1924, Anthony Caro’s prestigious career spans more than five decades, during which he has received numerous honors, critical acclaim, and widespread renown as Britain’s most important living sculptor. Knighted by the Queen of England in 1987, Caro was appointed to the Order of Merit (OM) in 2000. Caro’s work is represented in over 150 museums and other public collections worldwide and he received a lifetime achievement award from the International Sculpture Center in 1997. After working as an assistant to Henry Moore and teaching art in London from the 1950s onwards, Caro first came to international recognition in the 1960s with his large-scale, abstract sculptures. These early works were among the first freestanding sculptures to be set directly on the ground. The series was revolutionary for confronting viewers head-on at a time when most monumental sculpture was still displayed on pedestals. It was during this period when Caro began his strong associations with the United States. In the 1960s Caro taught at Vermont’s Bennington College and in 1982 he founded Triangle Artists’ Workshop in Pine Plains, New York, where he provided a working environment for painters and sculptors from around the world. Caro is the only contemporary sculptor to have been exhibited at London’s National Gallery (in 1998) and was the subject of an important mid-career retrospective at New York’s Museum of Modern Art in 1975. In 2005, the Tate Britain in London presented a major Caro retrospective. Outside the U.S., Anthony Caro is represented by Annely Juda Fine Art, London.